After a short but difficult battle with cancer, Franki Yanick (nee Filuk) passed away peacefully on April 10, 2019 at her home in Comox, British Columbia. Franki was born in Swan River, Manitoba on June 15, 1938. She was part of a family of 15 siblings and is survived by her brothers Tim Filuk (Mesa, Arizona), Wally Filuk (Calgary), Harve Filuk (San Diego, California) and her sisters Olga Elenko (Fairmont), Jennie Oleksy (Lethbridge), Ruth Narusis (Nanoose Bay) and Anne Lietz (Victoria). After leaving the family farm, Franki became a teacher and spent her early career in Winnipeg and the surrounding area. At that time, she met the love of her life Larry (Tickety Boo) Yanick, and after a far too long courtship (in her opinion), they were married and began their life together. Franki and Larry moved from Manitoba to Lethbridge, Alberta in 1968, where Larry continued his teaching career and Franki started a new endeavour as a loving mother. She is survived by her son David Yanick and his partner Sue Finneron. as well as her daughter Jenia Blair and son-in-law Glen Blair (Prince George). Once David and Jenia were old enough, Franki began her second career as a real estate agent. Over the course of 20 plus years, she became the number one real estate agent in Lethbridge and took immense pride in helping countless numbers of families finding their perfect home. The passion of life for Franki came from her four grandchildren. Logan and Lauren Yanick (David Yanick & Dawna Merriman) and Olivia and Finnegan Blair (Jenia & Glen Blair). Her grandkids were in constant touch with her over her past days through texts and phone calls. Nothing gave her more joy than discussing golf and hockey with Logan, getting social updates from Lauren, receiving updates on school exams from Olivia and hearing jokes from Finn. They kept her spirits high and helped her through the daily challenges she faced. In 1999, Franki retired from her real estate career and she and Larry moved to Comox to help raise their grandkids. She was a regular feature at dance recitals, volleyball games, hockey and golf tournaments. She loved spending time with her grandkids and was their number one fan. Other than looking after her family, Franki had three main passions in life. The first was cooking -especially Ukrainian traditional food such as perogies, cabbage rolls and borscht. She hosted numerous family gatherings where no one went home hungry. Her Christmas baking (especially the poppycock) was also famous and enjoyed by many family and friends. Her second passion was working on traditional Ukrainian Easter Eggs designs. Over the course of 40 plus years, she became a master in this art form. She never thought about selling any of her eggs, but instead provided them as gifts to friends and family members. The third passion for Franki was golf. 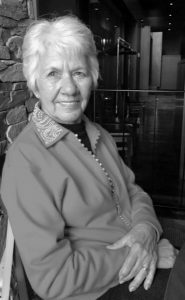 She loved to play, watch, and talk golf. Her “golf gang” of ladies were incredibly important to her. They shared endless laughs and she cherished her time with them. The family would like to send out special thank you’s to those who looked after Franki during her illness; Dr. Doug Anderson and the staff at the Comox Medical clinic, Dr. Willis Tien, Dr. Sunil Parimi and the VIHA palliative nurses. And a very special thank you to Dawna Merriman, Franki’s personal home-care nurse. Dawna was there for Larry and was there for Franki. Her kindness and gentle touch will not be forgotten. At mom’s request, there will be no local public service. Her ashes will be placed alongside her beloved Larry at the Mountain View Cemetery in Lethbridge, Alberta. The family gratefully declines flowers but would ask that donations be made to the charity of your choice in memory of Franki. We would also like to ask that you have a nip of scotch (and maybe a side of kale) tonight and cheer the memory of a very special wife, mother, grandmother and friend. I’m very sad to hear about Franki’s passing. The first home she sold when she started her real estate career was to us, and she remained our agent until she left Lethbridge. Her warmth and humour and her devotion to her family made her a lovely person to be around. She had a dazzling smile and a twinkle in her eye. It’s so hard to believe that both she and Larry are gone. My condolences and hugs to the family.